The pilot for a short-lived German action series plays off like a made-for-TV martial arts version of Die Hard. However, thanks to Donnie Yen’s frenetic choreography, this is a pretty decent film. Josh Engel is a tae kwon do teacher who teaches kids and is known by his nickname, “The Puma”. When his niece Lisa visits the school, she finds herself bored even when Josh is confronted by two thugs on the street. She decides to make a run for it, prompting Josh to follow her. She ends up at the local mall, where a meeting between investors is overtaken by a terrorist group led by Carlo Bless. As Josh finds himself using his martial arts skills against Bless’s men, he soon learns that Lisa has been kidnapped and is made part of the hostage group. Bless wants a large ransom from the police. Josh soon learns that he is not alone as police detective Jackie Winter and her partner Mehmet Schulz have been able to break their way in the mall and assist Josh as for Jackie, she holds a grudge against the terrorist leader. Directed by Axel de Roche, this is a definitive made-for-TV quality film. With a Die Hard-esque plot to the film, the hero of the film is not a cop, but an average martial arts instructor who finds himself at the wrong place and the wrong time. However, lead actor Mickey Hardt makes the role of Josh Engel work. Unlike the tough guys of the action world, Hardt’s character more resembles that of Jackie Chan: an likable everyman who must use his wits and skills to fight the bad guys. We even get a preamble to the plot when Josh takes on two street thugs in his school in front of his class and brings a sense of likability to the role. Susanne Hoß does quite well as Inspector Jackie Winter, a no-nonsense cop with Ercan Durmaz as the typical bumbling partner to her tough cop persona. Jochen Nickel does quite well as the villain here with British powerhouse Mike Lambert as his top henchman Pete. Hoss gets in on some of the action herself as well as Lambert, who once again will impress fans with his agile kicking skills. And who is the one responsible for the frenetic martial arts action? Donnie Yen. Yen definitely knows good talent and finds it in Hardt, an actor who had been studying martial arts since his childhood. Hardt is very impressive in the action department showcasing his amazing kicking and hand work. Hardt doesn’t need to rely on weapons, just his sheer instinct and fast martial arts skills to dispatch the bad guys. This clearly is Hardt’s show and he brings it. The pilot would eventually lead into a short-lived series that ran for only nine episodes. However, impressed with Hardt’s skills, Donnie Yen rallied and had Hardt casted as the lead villain for the 2003 film The Twins Effect and even more so, Mickey Hardt attempted at international stardom with two films as former kickboxer turned sports photographer Max Havoc in 2004 and 2006. Since then, he has worked primarily out of Germany as an actor, model, and musician. 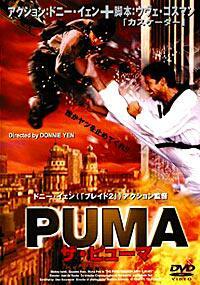 Der Puma: Kämpfer mit Herz is a pretty good made-for-TV pilot with exciting martial arts sequences from Donnie Yen. Definitely worth seeing for Mickey Hardt’s likable character and frenetic skills. RTL presents a Nostro Film production in association with Odeon Film. Director: Axel de Roche. Producer: Marcus Mende, Greta Müller, and Christian Popp. Writer: Uwe Koßmann. Cinematography: Mathias Neumann. Editing: Eva Lopez. Cast: Mickey Hardt, Susanne Hoß, Maria Petz, Rolf Becker, Aco Jovanovic, Jochen Nickel, Ercan Durmaz, Armin Dillenberger, Michael Ian Lambert. The following clip is not from the pilot, but from an episode of the short-lived series.